By: Gary Gilbert, P.E., G.E., Josue Vaglienty, P.E., and Remi Candaele, P.E. This year over 60 ASCE members from the Los Angeles Section attended the Society’s Global Conference in Panama. Below is a summary of some of the interesting adventures we experienced and the historical details we learned about. Ambitions to build a canal through Panama originate from the 16th century as Spanish conquistadors drew the first working plans in 1529. A French company, led by Ferdinand de Lesseps, also known as the successful builder of the Suez Canal, attempted the construction of a sea-level canal from 1879 to 1899. In exchange for American naval support of Panama’s independence from Columbia, the United States acquired the rights to build and operate a canal across the Panamanian Isthmus in 1903. Between 1904-1914, the United States took the approach of building locks along a canal instead of a sea-level crossing. As early as 1883, studies showed that there was a tidal range of 20 feet at the Pacific, as opposed to 1 foot at the Atlantic. It was only possible by making great strides in combating yellow fever and malaria in order to stabilize the workforce. The construction of locks also helped reduce the amount of earthwork required and the new levees provided a place for spoils from the excavation. An amazing item was how many pieces of equipment were constructed specifically for the project. In 1977, the Trujillo-Carter Treaty was signed between the United States and Panama with the intent of handing all canal authority and operations to Panama in 1999. The US started construction on a new set of locks in the 1930’s to accommodate larger battleships. However, after World War II, the use of battleships was discontinued in warfare and the locks were never completed. The current lock system has three sets of locks: two on the Pacific Ocean side (Miraflores locks and Pedro Miguel locks) side and one of the Atlantic Ocean side (Gatun locks). In 2007, the Panama Canal Authority initiated construction of an additional 3rd set of new larger locks, designed to accommodate 80 percent of the world’s ships. The new lock system will consist of two sets of new locks (one on Pacific Ocean side and the other on the Atlantic Ocean side). Each of these new locks will utilize a system of three water-reutilization basins that will conserve approximately 50% of the water consumed in conveying ships through the canal. 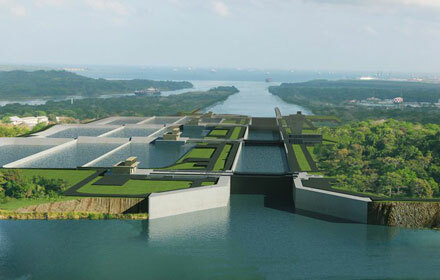 Mega sized ships that have been recently constructed will not be able to use these new locks at the Panama Canal. However, it appears that planning and evaluation of future ship accommodations is currently underway for a 4th set of even larger locks. Some of the tours of the construction of the new Atlantic locks were taken inside the locks in buses and were able to experience the construction up close. It was a special moment, because the locks will be under water in a year. The existing dam was almost overtopped a few years ago from a major flood event. Design is underway to create a new spillway to allow for the release of additional water during larger rainfall events. 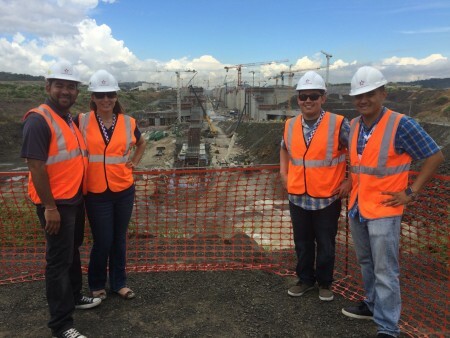 The dam only generates electricity during the rainy season and this year is a drought year. There are plans to increase the height of the gates to the spillway to allow for the increase in the water level behind the dam to accommodate larger ships. Currently there are two bridges that cross over the canal near the Pacific Ocean side. On the Atlantic Ocean side there is currently a small road that crosses in front of the Gatun locks and is closed when a ship crosses. A new 4-lane cable-stay bridge is under construction and will be the longest cable-stay bridge in the world that is concrete and not composite decking. The reason for the more expensive concrete bridge is to reduce maintenance cost due to corrosion from the ocean environment. 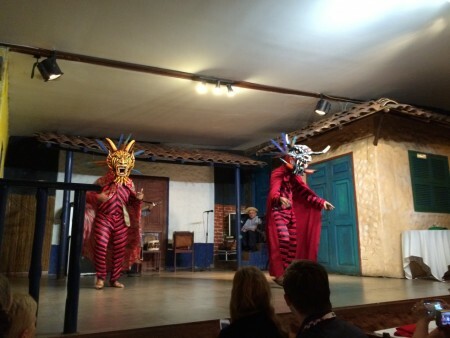 In addition to the outstanding sessions on both the history and the expansion project of the Canal, and the networking opportunities with civil engineers from all around the globe, ASCE Orange County attendees enjoyed visiting the historical Hispanic settlement of Castroviejo, eating fresh seafood at the Mercado del Marisco, and discovering the Smithsonian Tropical Research Institute. 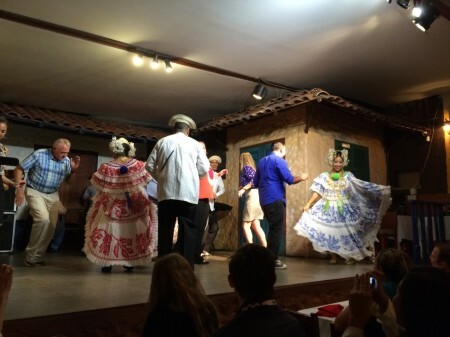 Ten ASCE Orange County members and nine students from Cal State Long Beach Student Chapter joined all 60 attendees from the Los Angeles Section for a memorable dinner animated with Panamanian folklore. Women artists wore la pollera, also recognized as the most beautiful dress in the world, an embroidered two-piece dress with an off-the-shoulder neckline, handmade lace and petticoats, gold chains around the neck, flowers and jewelry in the hair, and satin slippers.